There is nothing new about: the situation around Arabian horse shows is difficult in Germany since a few years. 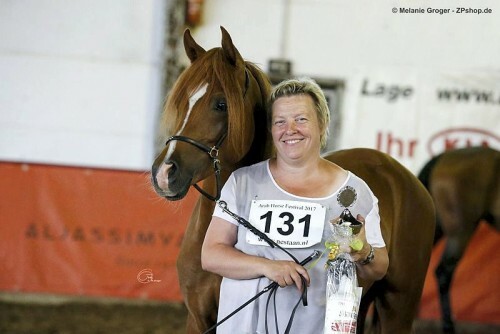 Nevertheless a dedicated group of people in Westphalia tries everything to offer Arabian horse breeders, owners and riders a well-organized event with a wide-range of possibilities to have fun with the horses. Their Arab Horse Festival in Westphalia is a fixed date in the calendar of Arabian horse enthusiasts. However, this year the proven organizing team offered something new. The ECAHO C show, the AJF Amateur Show and the riding competition were usually held in September, quite close to the All Nations Cup. 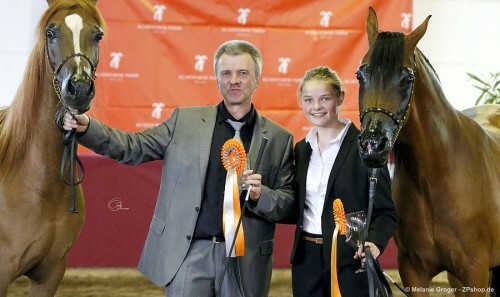 New place, new date: for the first time, the event was held at the wonderful Equestrian Center Hörste in June. The German Arab Horse Society also offered a National Championship for Anglo-Arabians, Shagyas and Partbred Arabians. A handful breeders took this opportunity so only one National title was awarded, which does not diminish the achievements of the winners! The blue and white rosettes flattered Collier Rubin’s chestnut colour, when he achieved the title of a National Champion. The lovely Arab x Pony Partbred stallion Collier Rubin, by Venustas Crazy Boy out of the Arabian mare Masallah, is bred by Bettina Mangels and proudly owned by Anita Scheele. Corinna Knaack-Lindemann enjoyed a busy and successful weekend receiving the rosettes for the National Reserve Champion with her selfbred Partbred mare Camar Estopia. 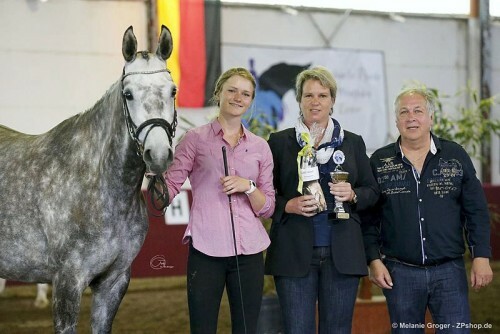 The mare is beautiful dapple-grey daughter of Holstein bred stallion Le Rouge, known for his dressage potential, and out of the Arabian mare Camar Esperanza and was well handled by Corinna’s daughter Isa Lindemann. Isa also presented Camar Estopia under saddle and garnered two second places in dressage competitions – and a first place in dressage with another selfbred Partbred, the pinto Camar Galiano. Somebody else had a busy weekend, the Arabian horse gelding Haifi El Sorrento. With his 165 centimetres, Haifi El Sorrento is a giant but with a gentle character and excellent dressage abilities. His sire is the European Champion Stallion BS Specific while Sorrento’s dam, Haifi Dinjah, is by the show jumper El Aswad. 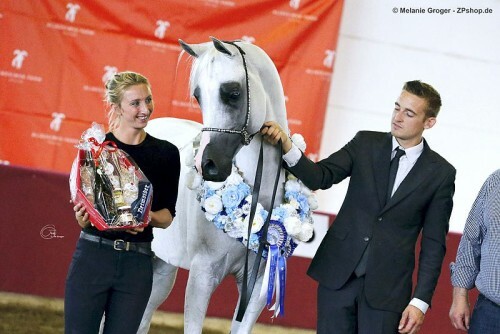 Together with his rider Susanne Hoyler, Haifi El Sorrento competes in dressage competitions since 2010. At the Arab Horse Festival, the gelding entered three classes and returned home with excellent results: a third place and two first, including the M-dressage. The field for the AJF Amateur Show was small though people had fun with their horses – and this is most important! Corinna Knaack-Lindemann and the newly wedded Andy Letsch had the honour to judge. Their unanimous choice for Best In Show Novice was the bay mare E.S. Raisin, bred by E- Stegeman and owned by VDB Arabians, Belgium. E.S. Raisin is by M.M. Sultan out of Ramaylla E.S. and traces back to world famous Rodania. Daniela Buske handled the Ghajar daughter Sellyn superior and received the title of Best In Show Amateur. Sellyn is bay mare bred by Peter Weber and owned by Heiko Quast, a beautiful bay with huge soulful eyes. The title for the Best In Show Experienced went to Lisa-Marie Heckenbücker and the wonderful Om El Bellissimo son Postar. This gelding was bred by Janow Podlaski and is out of Pomerania. The 2012 born stallion Khaled Al Hamad garnered the title “Best In Show” at the ECAHO C-show. The Ajman Moniscione son out of Magnificent PPA, bred by Nina Novembre, USA, is no newcomer to the show scene. Khaled Al Hamad, proudly owned by HH Sheikh Hamad Khaled Al-Hamad Al-Malik Al-Sabah, was named Tulip Cup Senior Champion earlier this year. Competitor and spectators enjoyed a well-organized show in a familiar atmosphere. Thank you to the organizing team for all their dedication and thank you to all sponsors, which made this Arab Horse Festival possible. We hope to see everybody again – and many, many more Arabian horse enthusiasts – next year!